Corticosteroids (CS) remain the most efficacious pharmacotherapeutic option for the management of asthma. Although the acute anti-inflammatory effects of CS treatment have been amply documented both clinically and experimentally, recent human data intimate that exposure to CS may be associated with retrograde immune phenomena, including enhanced synthesis of IgE in vivo and elevated Th2 cytokine production in vitro. We have investigated the long-term immunologic effects of CS treatment in a murine model of allergic airway inflammation. CS treatment during initial exposure to OVA or upon long-term Ag rechallenge remarkably attenuated eosinophilic airway inflammation and airway hyperresponsiveness. Interestingly, however, Th2 cytokine production by cultured splenocytes from CS-treated mice was significantly elevated, while IFN-γ synthesis was depressed. Moreover, mice rechallenged with OVA several weeks after CS intervention during allergic sensitization not only developed airway inflammation, but also exhibited enhanced Th2 cytokine production in lymphoid tissues and OVA-specific IgE in serum. This amplification of the systemic immune response was associated with an intact APC compartment during CS-conditioned sensitization to OVA. These data indicate that immune processes underlying the allergic phenotype remain impervious to CS treatment and raise the possibility that treatment with CS during sensitization may amplify elements of the allergen-specific immune response. Corticosteroids (CS)3 have emerged, deservedly, as the pharmaceutical of choice for patients with chronic inflammatory conditions. The development of inhaled CS, in particular, has revolutionized the treatment of asthma and is now the inimitable standard to which all prospective asthma therapies are compared. Indeed, by affording exquisite control of local inflammatory processes in the lung and therefore reversing attendant airway dysfunction, inhaled CS effectively ameliorate asthma morbidity. In recent years, research into steroids has primarily extended our knowledge of the cellular and molecular mechanisms by which pharmacological intervention with CS might attenuate inflammation. This research has uncovered pathways, such as inhibition of the proinflammatory transcription factors AP-1 and NF-κB (transrepression), direct activation of anti-inflammatory gene transcription through glucocorticoid responsive elements on DNA (transactivation), or mobilization of apoptotic processes, that are engaged when steroids associate with endogenous glucocorticoid receptors (1). In human asthmatics, the anti-inflammatory activity of inhaled CS has been associated, for instance, with impaired recruitment of eosinophils and other leukocytes to the airway and with attenuated production of Th2 cytokines and other inflammatory mediators (2, 3, 4); in mice, inhaled CS treatment has also been shown to suppress eosinophil progenitor expansion in the bone marrow, pointing to the systemic effects of local steroid delivery (5). These studies have furnished a rich mechanistic foundation upon which the development of new generations of highly specialized steroid-based therapeutics will draw (6, 7, 8, 9). However, informed by the understanding that steroids are effective at managing inflammation only as long as they are taken, investigators have directed comparatively little attention to the long-term immunobiological implications of steroid delivery: whether steroids have the capacity to alter substantively the evolution and pathogenesis of allergic airway disease. Our study examines this question in a murine model of asthma in which mice are re-exposed to Ag several weeks after steroid intervention has been discontinued. Our observations derive two unequivocal conclusions: 1) that concurrent delivery of CS during mucosal allergic sensitization does not prevent the development of a local airway inflammatory response upon Ag re-exposure and 2) that CS treatment during sensitization actually amplifies cardinal systemic features of the allergic phenotype both acutely and during long-term Ag rechallenge. Female BALB/c mice (6–8 wk old) were purchased from Charles River Laboratories (Wilmington, MA). The mice were housed under specific pathogen-free conditions and maintained on a 12-h light-dark schedule. All experiments described in this study were approved by the Animal Research Ethics Board of McMaster University. A total of 442 mice were sacrificed during the course of these experiments. Mice were subjected to a model of musocal allergic sensitization as previously described (10). Briefly, mice were exposed to aerosolized OVA in the context of GM-CSF overexpression in the airway microenvironment. To elicit local expression of GM-CSF, a replication-deficient human type 5 adenoviral (Ad) construct encoding murine GM-CSF cDNA in the E1 region of the viral genome was delivered intranasally to isoflurane-anesthetized animals on day −1, 24 h before the first exposure to OVA. Ad/GM-CSF was administered at a dose of 3 × 107 PFU in a total volume of 30 μl of PBS vehicle. Over a period of 10 consecutive days (days 0–9), mice were placed in a Plexiglas chamber (10 cm × 15 cm × 25 cm) and exposed for 20 min daily to aerosolized OVA (1% w/v in 0.9% saline; Sigma-Aldrich, Oakville, Ontario, Canada). The OVA aerosol was generated by a Bennett nebulizer (Pleasanton, CA) at a flow rate of 10 L/min. For the long-term in vivo rechallenge experiments, sensitized mice were allowed to recover from acute inflammation (∼4 wk) and were then exposed to a 1% OVA aerosol for 20 min on 3 consecutive days (rechallenge days 0LT to 2LT). Models are depicted in Fig. 1⇓. Models of Ag-induced allergic airway inflammation and CS administration. a, Model of acute CS intervention: Mice were exposed daily to OVA in the context of a GM-CSF-conditioned airway microenvironment with concurrent CS treatment. b, Model of long-term therapeutic CS intervention: Mice were sensitized to OVA in the absence of CS treatment; inflammation was permitted to resolve (∼4 wk) before mice were rechallenged with OVA while being treated with CS. 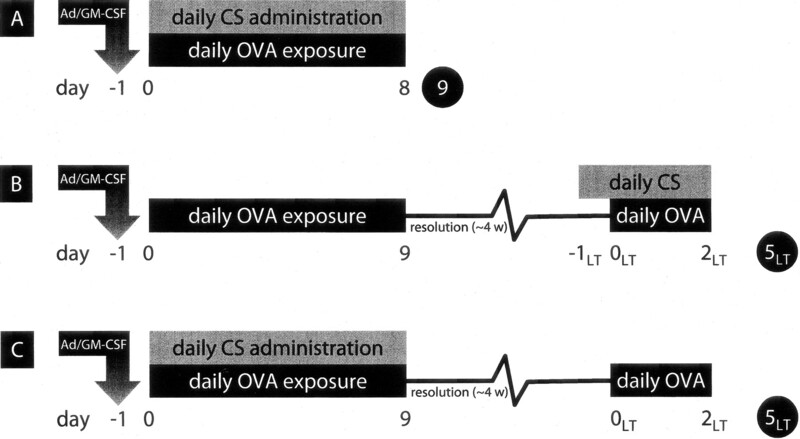 c, Model of the long-term effects of acute CS intervention: Mice were sensitized to OVA while being treated with CS; mice were rechallenged with OVA in the absence of further CS treatment. Numbers in circles indicate time points at which outcomes were measured. We used a pharmaceutical grade, modified Wright Dust Feed system (AstraZeneca, Lund, Sweden) to generate a dry powder aerosol of budesonide in lactose vehicle or of lactose alone. A Battelle (Columbus, OH) two-stage inhalation chamber was used; it contains 15 inhalation ports and 1 filter sampling port, thus allowing us to expose 15 mice simultaneously. Filtered, desiccated air flowed through the Wright Dust Feed at a rate of 10 L/min or 0.63 L/min/port; the rate of evacuation from the chamber was 8 L/min. The concentration of steroid powder entering the chamber was monitored with a real-time aerosol dust monitor (Casella CEL, Kempston, Bedford, U.K.). For these studies, the generated concentration of budesonide powder in the chamber was 800 mg/m3 or 0.8 μg/ml, and mice were exposed to budesonide for 10 min per treatment. The inhaled dose is calculated using the following formula: ID = ET × RMV × CC/BW, where ID = inhaled dose (μg/g), ET = exposure time (min), RMV = respiratory minute volume = 4.19 × BW2/3 (ml/min), CC = chamber concentration (μg/ml), and BW = body weight (g). Using this equation, we have calculated an inhaled budesonide dose of 12.3 μg/g for a 20-g mouse. The overall systemic bioavailability of budesonide is a factor of both lung-deposited dose and swallowed dose. In humans, lung deposition of aerosolized budesonide is on average 20% and gut deposition 50%; in mice, ∼4% is deposited in the lung and 36% in the gut. Approximately 90% of the portion of drug deposited in the gut is inactivated in the liver via first-pass metabolism. The portion of drug deposited in the lung is absorbed into the circulation, but only 25% of this is inactivated by first-pass metabolism (AstraZeneca, unpublished data). Taking into account these considerations and the fact that budesonide has a Mr of 430.53 g, the nominal maximum bioavailable dose of budesonide mice received was 0.86 nmol/g via the lung and 1.0 nmol/g via the gastrointestinal tract, for a total systemic bioavailability of 1.86 nmol/g; however, because of inherent inefficiency of the apparatus and concomitant overestimation of budesonide concentration by the dust monitor, the actual bioavailable dose was typically one-third the nominal dose (for a final bioavailability of 0.62 nmol/g). By comparison, the bioavailable dose achieved in humans taking 3.2 g of budesonide daily is approximately 0.018 nmol/g. Twenty-four hours after the ninth OVA exposure (day 9) or 72 h after the third OVA exposure during long-term in vivo recall (day 5LT of the rechallenge protocol), mice were sacrificed and bronchoalveolar lavage (BAL) was obtained as previously described (11). In brief, the lungs were dissected and the trachea was cannulated with a polyethylene tube (BD Biosciences, Oakville, Ontario, Canada). The lungs were lavaged twice with PBS (0.25 ml followed by 0.2 ml). Approximately 0.3 ml of the instilled fluid was consistently recovered. Total cell counts were determined using a hemocytometer. After centrifugation, supernatants were stored at −20°C for measurement of cytokines by ELISA; cell pellets were resuspended in PBS and smears were prepared by cytocentrifugation (Shandon, Pittsburgh, PA) at 300 rpm for 2 min. Diff-Quik (Baxter, McGraw Park, IL) was used to stain all smears. Differentiation of leukocyte subsets in BAL was determined by counting at least 500 white blood cells using standard hemocytological procedures to classify the cells as neutrophils, eosinophils, lymphocytes, or macrophages/monocytes. Additionally, blood was collected by retro-orbital bleeding. Serum was obtained by centrifugation after incubating whole blood for 30 min at 37°C. Blood smears were prepared from peripheral blood collected in heparinized capillary tubes; leukocytes were differentiated by counting at least 300 white blood cells. Finally, lung tissue was fixed in 10% Formalin and embedded in paraffin. Three-μm-thick sections were stained with H&E for visualization of leukocytes and histopathological features. ELISA kits for GM-CSF, IFN-γ, IL-4, IL-5, and IL-13 were purchased from R&D Systems (Minneapolis, MN); each of these systems has a threshold of detection of 1.5–7 pg/ml. Levels of OVA-specific IgE were detected using an Ag-capture (biotinylated OVA) ELISA method as described previously (11); anti-mouse IgE Abs were obtained from Southern Biotechnology Associates (Birmingham, AL). This ELISA was standardized with serum obtained from mice sensitized to OVA according to a conventional i.p. sensitization model and bled 7 days following the second sensitization (11); Ig levels, therefore, are expressed in units per milliliter relative to this standard serum. Using the plunger from a 5-ml syringe, spleens or thoracic lymph nodes were triturated through a 40-μm nylon cell strainer (BD Falcon, Bedford, MA) into HBSS. RBC in splenocyte preparations were lysed by resuspending dispersed cells from each spleen in 1 ml of ACK lysis buffer for 1 min. Splenocytes were then washed twice in supplemented RPMI 1640 (containing 10% FBS, 1% penicillin/streptomycin, 1% l-glutamine, and 0.1% mercaptoethanol); lymph node mononuclear cells were washed once. Splenocytes and lymph node mononuclear cells were cultured in 96-well plates at a density of 8 × 105 or 6 × 105 cells/well, respectively, in a total volume of 200 μl of RPMI 1640. Cells were stimulated with OVA at a concentration of 40 μg/well for 5 days, at which point supernatants were harvested and stored at −20°C for detection of cytokines. OVA-specific, IL-4-, IL-5-, or IFN-γ-producing T cell clones in the spleen were detected with an ELISPOT assay (BD Biosciences). Dispersed splenocytes were plated at a density of 8 × 105 cells/well in a 96-well ELISPOT plate that had been precoated with the appropriate anti-mouse cytokine Ab; cells were cultured in medium alone or stimulated with 40 μg/well OVA for 72 h, after which immobilized, secreted IL-4, IL-5, or IFN-γ was detected with the corresponding biotinylated anti-mouse cytokine Ab according to the protocol included with the ELISPOT kit. Each plate was developed via streptavidin-HRP reaction for 5 min, desiccated, and imaged using AxioVision software (Zeiss, Thornwood, NY); QWin software (Leica Microsystems, Richmond Hill, Ontario, Canada) was adapted for automated, color-dependent enumeration of spots. 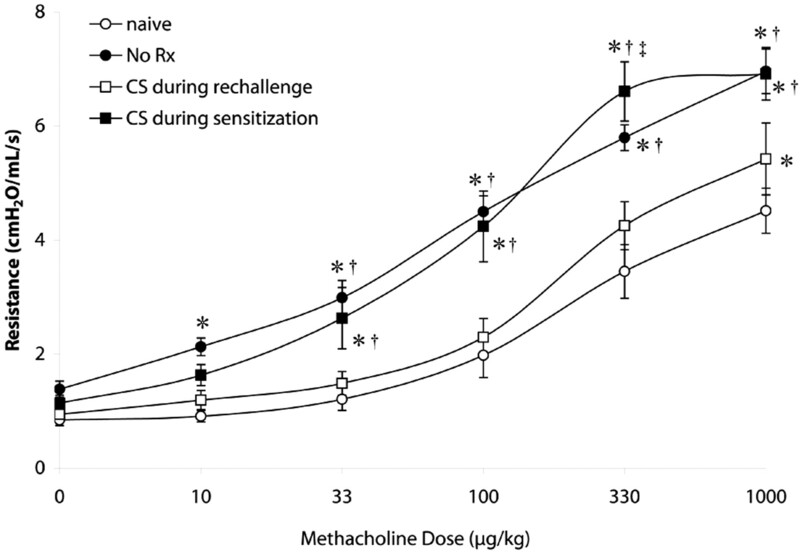 Airway responsiveness was measured based on the response of total respiratory system resistance (RSR) to increasing doses of methacholine (MCh) injected into the internal jugular vein of Avertin-anesthetized mice as previously described (12). Exposed tracheas were cannulated and a constant inspiratory flow was delivered by mechanical ventilation (RV5; Voltek Enterprises, Toronto, Ontario, Canada). Paralysis was achieved using pancuronium (0.03 mg/kg i.v.) to prevent respiratory effort during measurement. RSR was measured following consecutive i.v. injections of saline, followed by 10, 33, 100, 330, and 1000 μg/kg MCh (ACIC, Brantford, Ontario, Canada), each delivered in a 0.2-ml bolus. Evaluation of airway responsiveness was based on the peak RSR measured in the 30 s following the saline and MCh challenges. Lungs were perfused with 10 ml of HBSS through the right ventricle, cut into small (∼2 mm in diameter) pieces, and agitated at 37°C for 1 h in 15 ml of collagenase III (Life Technologies, Rockville, MD) at a concentration of 150 U/ml in HBSS. Using the plunger from a 5-ml syringe, the lung pieces were triturated through a 40-μm nylon cell strainer (BD Falcon) into HBSS. Mononuclear cells were isolated at the interphase between layers of 30 and 60% Percoll following density gradient centrifugation. Cells were washed twice and stained for flow cytometric analysis. For each Ab combination, 1.0 × 106 cells were incubated with mAbs at 0–4°C for 30 min; the cells were then washed and treated with second-stage reagents. Intracellular cytokine staining was executed according to the protocol detailed in the Cytofix/Cytoperm GolgiPlug kit (BD Biosciences). Briefly, dispersed lung mononuclear cells were cultured in six-well plates at a density of 2 × 106 cells/ml in the context of GolgiPlug reagent (brefeldin A) alone (1 μl/ml supplemented RPMI 1640) or concurrent LPS stimulation (1.0 μg/ml); cells were harvested after an 8-h incubation and, after surface staining, cells were fixed in Cytofix/Cytoperm solution (4% paraformaldehyde in PBS) and permeabilized in Perm/Wash buffer (saponin/sodium azide concentrate, diluted 1/10 in distilled water) for intracellular staining. All data were collected using a FACScan (BD Biosciences) for three-color flow cytometry and were analyzed using WinMDI software (The Scripps Research Institute, La Jolla, CA). The following Abs and reagents were used: mouse IgG3 anti-mouse MHC class II (MHCII; I-Ad), FITC-conjugated and biotinylated (39-10-8); rat IgG2b anti-mouse CD11b, FITC- and PE-conjugated (M1/70); hamster IgG anti-mouse CD11c, FITC- and PE-conjugated (HL3); hamster IgG anti-mouse B7.1, biotinylated (16-10A1); rat IgG2a anti-mouse B7.2, biotinylated (GL1); rat IgG1 anti-mouse IL-12, PE-conjugated (C15.6); hamster IgG anti-mouse CD3ε, PE-conjugated and CyChrome-conjugated (145-2C11); rat IgG2a anti-mouse CD4, FITC-conjugated and CyChrome-conjugated (RM4-5); hamster IgG anti-mouse CD69, PE-conjugated (H1.2F3) (all purchased from BD PharMingen, Mississauga, Ontario, Canada); rat IgG1 anti-mouse T1/ST2, FITC-conjugated (produced in-house by Millennium Pharmaceuticals, Cambridge, MA); all appropriate isotype control Abs and streptavidin-PerCP (BD PharMingen). The Abs were titrated to determine optimal concentration. Data are expressed as mean ± SEM, unless otherwise indicated. Results were interpreted using Student’s t test or ANOVA with Tukey’s post hoc test, where appropriate. Differences were considered statistically significant when p < 0.05. To assess the acute anti-inflammatory effects of CS intervention, mice were exposed to aerosolized OVA for 20 min on 9 consecutive days (0–8) beginning 24 h after intranasal administration of Ad/GM-CSF (day −1); a subset of mice was treated with nebulized budesonide at a concentration of 0.8 μg/ml for 10 min immediately before each OVA exposure (model A in Fig. 1⇑). Fig. 2⇓A illustrates inflammation in BAL at day 9 of the aerosolization protocol. 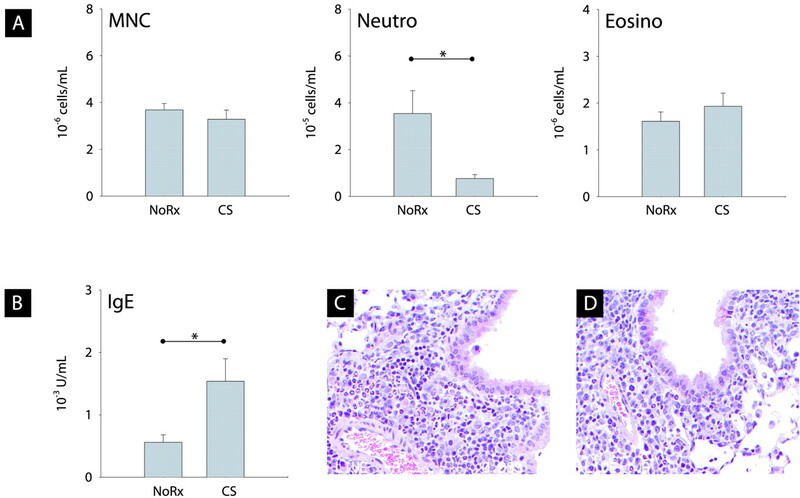 CS treatment dramatically inhibited inflammation in the airways compared with both untreated sensitized mice (NoRx) and mice receiving nebulized lactose vehicle; eosinophilia, in particular, was completed abrogated by CS intervention. The attenuated cytokine and chemokine content in BAL of CS-treated mice mirrors these cellular data (Table I⇓); indeed, levels of the Th2-affiliated cytokines IL-5 and IL-13, of the chemokines macrophage-inflammatory protein 1α (MIP-1α) and RANTES, and of IFN-γ were all reduced in the context of CS intervention, asserting the unequivocal anti-inflammatory properties of CS in this model at the molecular level. In contrast, data in Fig. 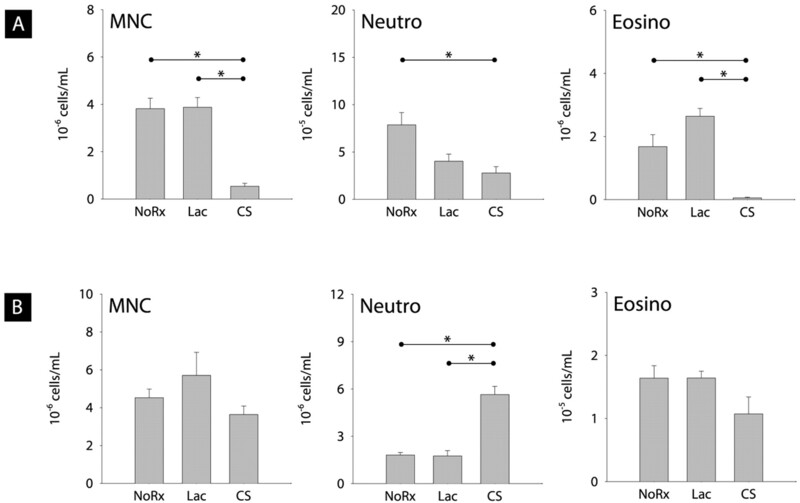 2⇓B demonstrate that CS therapy elicited no statistically significant qualitative or quantitative changes in the peripheral blood leukocyte profile, except the expected elevation in neutrophils due to the well-documented, CS-induced demargination of these cells, compared with untreated and lactose-treated controls. Moreover, and paradoxically, OVA-specific IgE in serum was elevated 2-fold following CS treatment (Table I⇓). CS intervention during allergic mucosal sensitization to OVA arrests inflammation in the airways of mice. Mice were sensitized to OVA in the context of a GM-CSF-conditioned airway milieu with or without concurrent CS treatment and sacrificed at day 9 of the aerosolization protocol. Graphs depict mononuclear cells (MNC), neutrophils (Neutro), and eosinophils (Eosino) in the BAL (A) and peripheral blood (B) of OVA-sensitized, untreated control mice (NoRx) or mice exposed to OVA in the context of either lactose vehicle (Lac) or powdered budesonide (CS). n = 5–12/group (pooled) from two experiments; ∗, p < 0.05. To translate our findings describing the impact of local CS administration during concomitant mucosal allergic sensitization to a different clinical paradigm, we treated previously sensitized animals with CS during long-term Ag rechallenge. To this end, mice were sensitized to aerosolized OVA according to our 10-day mucosal sensitization regimen and permitted to recover from acute inflammatory phenomena, which are completely resolved by day 28. Groups of mice were then treated with nebulized budesonide on day −1LT of the rechallenge protocol, followed by three daily 20-min exposures to aerosolized OVA preceded by CS therapy (days 0LT to 2LT); mice were sacrificed on day 5LT, the peak of airway inflammation following this Ag recall procedure (R. E. Wiley, B. U. Gajewska, J. R. Johnson, and M. Jordana, unpublished data; model B in Fig. 1⇑). Data in Fig. 3⇓A illustrate that the accumulation of all inflammatory cells, especially eosinophils, in BAL was abolished in mice concurrently receiving CS compared with untreated mice and mice receiving lactose (data not shown; it should be noted that, for simplicity, the lactose control has been excluded from this and subsequent figures since lactose intervention had no effect on any immune-inflammatory parameter examined). 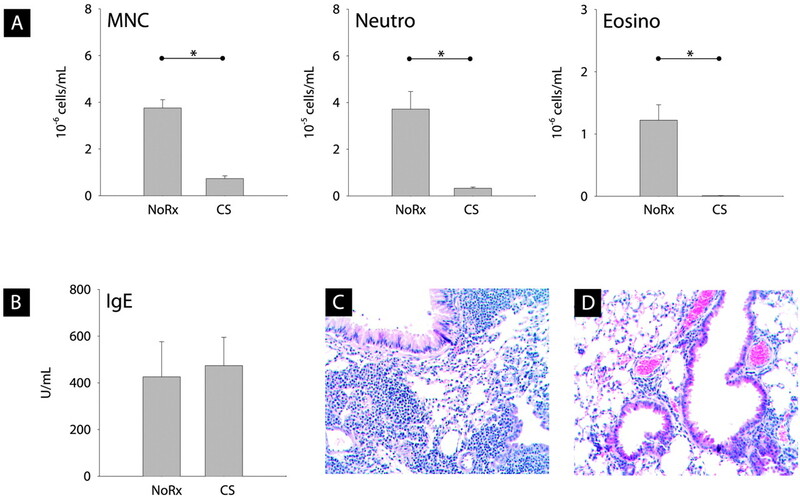 In agreement with findings in BAL, histological examination of lung tissue from CS-treated mice revealed attenuated peribronchial and perivascular inflammation and reduced goblet cell hyperplasia and mucous secretion compared with untreated mice (representative sections are displayed in Fig. 3⇓, C and D). In contrast and consistent with observations in mice treated during sensitization, levels of OVA-specific IgE, which are substantially elevated at recall, were unaffected by CS intervention (Fig. 3⇓B), although there was a modest reduction in eosinophil content in peripheral blood (Table II⇓). CS treatment during long-term OVA rechallenge of mice with established allergy ablates airway inflammation but has no impact on circulating OVA-specific IgE. Mice were sensitized to OVA in the context of a GM-CSF-conditioned airway milieu, and acute inflammatory processes were subsequently permitted to resolve (∼4 wk); mice were then sacrificed 72 h following three daily re-exposures to aerosolized OVA in the presence or absence of concurrent CS delivery. Graphs depict mononuclear cells (MNC), neutrophils (Neutro), and eosinophils (Eosino), in the BAL (A) and OVA-specific IgE in serum (B) of OVA-sensitized, untreated control mice (NoRx) or mice rechallenged with OVA in the context of powdered budesonide (CS). C and D, Representative H&E-stained cross-sections from the lungs of untreated and steroid-treated mice, respectively. Original magnification, ×100. n = 7–10/group (pooled) from two experiments; ∗, p < 0.05. Impelled by the observation that acute CS administration, while ablating the local inflammatory response, does not appreciably affect peripheral blood leukocytosis and actually results in elevated levels of serum IgE, we examined OVA-specific immune activity in the spleen. Fig. 4⇓ illustrates Th2 cytokine production by cultured splenocytes harvested from untreated and CS-treated mice at day 9 of the aerosolization protocol. Interestingly, splenocytes from CS-treated mice liberated 2- to 3-fold more IL-4, IL-5, and IL-13 upon stimulation with OVA than cells from untreated controls, while IFN-γ production was significantly depressed. This elevation in Th2 cytokine production, moreover, cannot be attributed to the disproportionate retention of OVA-specific clones in the spleens of CS-treated mice, as ELISPOT analysis of cultured splenocytes identified no difference in the frequency of IL-5-producing cells upon OVA stimulation (Table III⇓); parallel enumeration of IL-4- and IFN-γ-secreting splenocytes also showed similar clone frequencies in CS-treated and untreated mice (data not shown). CS intervention during allergic mucosal sensitization to OVA enhances Th2 and attenuates Th1 cytokine production by cultured splenocytes. Mice were sensitized to OVA in the context of a GM-CSF-conditioned airway milieu with or without concurrent CS treatment and sacrificed at day 9 of the aerosolization protocol; spleens were harvested and dispersed splenocytes were cultured for 5 days in medium alone (▪) or in the context of OVA stimulation (▦). Graphs depict IL-4, IL-5, IL-13, and IFN-γ in culture supernatants of splenocytes from OVA-sensitized, untreated control mice (NoRx), or mice exposed to OVA during concurrent delivery of powdered budesonide (CS). Data are representative of two independent experiments; n = 7–8/group; ∗, p < 0.05. Informed by the findings in the spleen, we investigated the implications of acute CS therapy for the long-term immune-inflammatory response to OVA. Mice were mucosally sensitized to OVA according to the 10-day aerosolization regimen in the presence or absence of concomitant CS treatment. Following the resolution of inflammation in the lung (by day 28), mice were re-exposed to aerosolized OVA on 3 consecutive days without additional CS intervention and sacrificed 72 h after the last OVA challenge (model C in Fig. 1⇑). Fig. 5⇓ indicates elevated OVA-specific Th2 cytokine production by splenocytes in vitro, verifying observations in the spleen at day 9. Data from cultured mononuclear cells harvested from thoracic lymph nodes following in vivo OVA recall (Table IV⇓) complement the findings in the spleen and underscore the long-term systemic effects of steroid therapy, i.e., OVA-induced production of IL-4, IL-5, and IL-13 was consistently higher in lymph node cells from rechallenged mice sensitized to OVA in the context of CS therapy; in contrast, we were unable to detect OVA-specific IFN-γ production above baseline levels in unstimulated lymph node cells from CS-treated mice (data not displayed). Enhanced Th2 cytokine production by cultured splenocytes from mice mucosally sensitized to OVA in the context of corticosteroid treatment persists during long-term OVA rechallenge. Mice were sensitized to OVA in the context of a GM-CSF-conditioned airway milieu with or without concurrent CS intervention and acute inflammatory processes were subsequently permitted to resolve (∼4 wk); mice were then sacrificed 72 h following three daily re-exposures to aerosolized OVA in the absence of further CS treatment. Spleens were harvested, and dispersed splenocytes were cultured for 5 days in medium alone (▪) or in the context of OVA stimulation (▦). Graphs depict IL-4, IL-5, and IL-13 in culture supernatants of splenocytes from OVA-sensitized, untreated control mice (NoRx) or rechallenged mice originally sensitized to OVA in the context of powdered budesonide delivery (CS). n = 4/group from a single experiment; ∗, p < 0.05. To elaborate these findings, we evaluated the consequences of this alleged sustained hyperpolarization of the Th2 phenotype on the allergic response in vivo. In particular, we examined inflammation in the BAL (Fig. 6⇓A) and histopathologically (Fig. 6⇓, C and D) following long-term rechallenge of mice initially sensitized to OVA in the absence or presence of concurrent CS treatment; we documented no overt changes in cellular inflammation 72 h after the last OVA exposure, with the exception of a small reduction in BAL neutrophilia, a finding of nominal significance given the minor contribution of neutrophils to the inflammatory profile at this time point. The indistinguishable nature of the airway inflammatory profile between untreated and CS-treated mice was verified by flow cytometric analysis of enriched lung mononuclear cells. Gated CD3+CD4+ cells expressed similar levels of the Th2 marker T1/ST2 (10–15%) (13, 14) and of the activation marker CD69 (24–28%) in the two treatment groups (data not shown graphically), intimating similar effector capacity of lung T cells. Importantly, however, levels of OVA-specific IgE in serum were considerably elevated, on the order of 3-fold, suggesting CS-mediated amplification of one of the cardinal immunological features of allergic airway disease (Fig. 6⇓B). Peripheral blood eosinophilia was also elevated by ∼80% upon rechallenge of mice sensitized to OVA in the context of CS treatment (Table V⇓). CS treatment during allergic mucosal sensitization has no impact on inflammation in the airways of mice during long-term OVA rechallenge, but results in dramatically elevated levels of circulating OVA-specific IgE. Mice were sensitized to OVA in the context of a GM-CSF-conditioned airway milieu with or without concurrent CS intervention and acute inflammatory processes were subsequently permitted to resolve (∼4 wk); mice were then sacrificed 72 h following three daily re-exposures to aerosolized OVA in the absence of further CS treatment. Graphs depict mononuclear cells (MNC), neutrophils (Neutro), and eosinophils (Eosino) in the BAL (A), and OVA-specific IgE in serum (B) of OVA-sensitized, untreated control mice (NoRx) or rechallenged mice originally sensitized to OVA in the context of powdered budesonide delivery (CS). C and D, Representative cross-sections from the lungs of untreated and steroid-treated mice, respectively. Original magnification, ×200. n = 7–10/group (pooled) from two experiments; ∗, p < 0.05. To ascertain the long-term physiological/functional impact of acute CS therapy and the associated potentiation of OVA-specific IgE, airway responsiveness to i.v. administered MCh was measured upon long-term OVA rechallenge of mice with established allergy. As indicated in Fig. 7⇓, budesonide treatment during OVA recall resulted in a dramatic reduction in airway resistance (to naive levels) compared with sensitized controls challenged without concurrent pharmacological intervention. In contrast, mice initially treated with CS during sensitization were afforded no protection against the airway physiological response during long-term recall, exhibiting a responsiveness curve similar to that observed in untreated controls. Airway hyperresponsiveness during long-term OVA recall of allergic mice is attenuated when CS are delivered during rechallenge, but not if treatment occurs exclusively during sensitization. Mice were sensitized to OVA in the context of a GM-CSF-conditioned airway milieu with or without concurrent CS intervention and acute inflammatory processes were subsequently permitted to resolve (∼4 wk); airway responsiveness to i.v. administered MCh was assessed 72 h following three daily re-exposures to aerosolized OVA in the presence or absence of additional CS treatment. Graph depicts airway resistance to increasing doses of MCh in naive mice, OVA-sensitized, untreated control mice (NoRx), in allergic mice treated with powdered budesonide during OVA rechallenge (CS during rechallenge), or in mice originally sensitized to OVA in the context of budesonide and rechallenged without further pharmacological intervention (CS during sensitization). n = 6–8/group from a single experiment; ∗, p < 0.05 compared with naive; †, p < 0.05 compared with CS during rechallenge; ‡, p < 0.05 compared with NoRx. That CS intervention during sensitization did not diminish, and even amplified, the long-term systemic immune response to OVA intimates that GM-CSF-induced differentiation and activation of the APC compartment was impervious to CS administration. We therefore used flow cytometry to analyze the phenotype of APC subsets in mononuclear cell-enriched lung homogenates between days 7 and 9 of the aerosolization protocol, the peak of pulmonary APC activity in this model (15). Although total numbers of mononuclear cells were predictably reduced in CS-treated mice (data not shown), the fraction of cells coexpressing MHCII and high levels of CD11c (dendritic cells) or CD11b (macrophages) was essentially identical to untreated controls and, importantly, dramatically higher than levels observed in naive mice (Fig. 8⇓A); with respect to dendritic cells in particular, there was a characteristic and visually unambiguous elevation in the intensity of MHCII staining on CD11chigh cells from CS-treated and untreated mice compared with naive controls. Moreover, analysis of costimulatory molecule expression on gated MHCII+CD11chigh and MHCII+CD11bhigh cells furnished evidence that the activated phenotype displayed by APC populations during sensitization was not depressed by concomitant steroid treatment (Fig. 8⇓B). Indeed, the definitive elevation in B7.1 and B7.2 expression on dendritic cells and macrophages observed in untreated mice was preserved and in the case of B7.1 enhanced by CS intervention; APC from naive mice (data not shown) express comparatively low levels of these costimulatory molecules (15). We supplemented this phenotypic analysis of the APC compartment by examining expression of IL-12, whose attenuation in the context of in vitro steroid treatment has been advanced as an explanation for the observed potentiation of Th2 cytokine production (16, 17, 18, 19, 20, 21, 22, 23). However, intracytoplasmic staining of lung mononuclear cells harvested from control mice or mice treated with steroids in vivo showed similar levels of IL-12 expression in gated MHCII+CD11c+ and MHCII+CD11b+ populations both spontaneously and following stimulation with LPS (Table VI⇓). CS intervention during mucosal allergic sensitization has no impact on pulmonary APC maturation. Mice were sensitized to OVA in the context of a GM-CSF-conditioned airway milieu with or without concurrent CS treatment and sacrificed at day 7 of the aerosolization protocol; lungs were harvested and enriched mononuclear cells from each group were pooled and stained for flow cytometric analysis. Dot plots in A display the fraction of cells in the mononuclear cell gate expressing a dendritic cell (MHCII+CD11chigh) or macrophage (MHCII+CD11bhigh) phenotype in naive, untreated control (NoRx) or budesonide-treated (CS) mice. 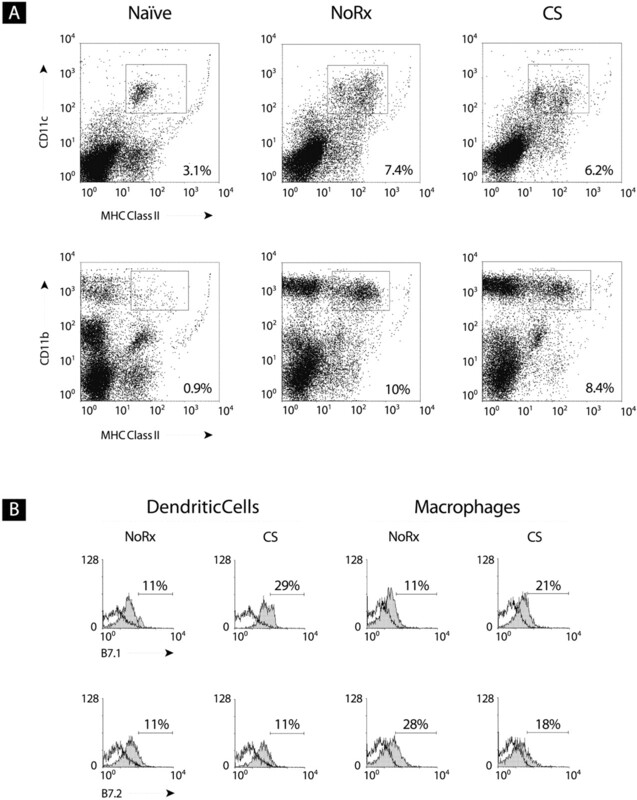 B, Gated dendritic cells and macrophages were assessed for expression of B7.1 and B7.2. The analysis is based on the collection of 100,000 events in the mononuclear cell gate and is representative of two independent experiments; n = 8–10 (pooled)/group. Research into synthetic CS has generally focused on the pharmacological properties and immunobiological targets that account for the unimpeachable efficacy of these drugs in the treatment of inflammatory diseases. However, notwithstanding their broad clinical applications, CS do not cure immune-inflammatory conditions and are therefore only provisionally therapeutic, their anti-inflammatory effects extinguished once treatment has been terminated. Building on this apparently intrinsic limitation of CS pharmacology, we have investigated the long-term effects of transient CS delivery in a model of asthma in which mice were mucosally sensitized to OVA in the context of CS treatment and, following resolution of acute inflammatory events in the airway, rechallenged with this Ag in the absence of further treatment. Administration of CS to mice during Ag exposure, either at sensitization or long-term rechallenge, remarkably attenuated local inflammatory processes in the lung. Indeed, the acute, Th2-polarized response elicited upon repeated daily exposure of mice to aerosolized OVA in the context of a GM-CSF-enriched airway milieu was averted by concurrent delivery of nebulized budesonide. Airway eosinophilia, the hallmark of this inflammatory response, was completely ablated, and other leukocyte subsets were similarly reduced in BAL (Fig. 2⇑A). Consistent with these cellular data, the Th2 cytokines IL-5 and IL-13 were appreciably lower in BAL of budesonide-treated mice, as were the chemokines MIP-1α and RANTES; IL-4 content in BAL, which is detected at very low levels in this model, was not significantly different from that of controls (Table I⇑). Paralleling these observations, budesonide exhibited a potent anti-inflammatory effect when administered to mice during long-term OVA rechallenge: airway eosinophilia, as assessed quantitatively in BAL, was dramatically reduced, and there was diminished evidence of peribronchial/perivascular inflammation and goblet cell hyperplasia histopathologically (Fig. 3⇑, A, C, and D). 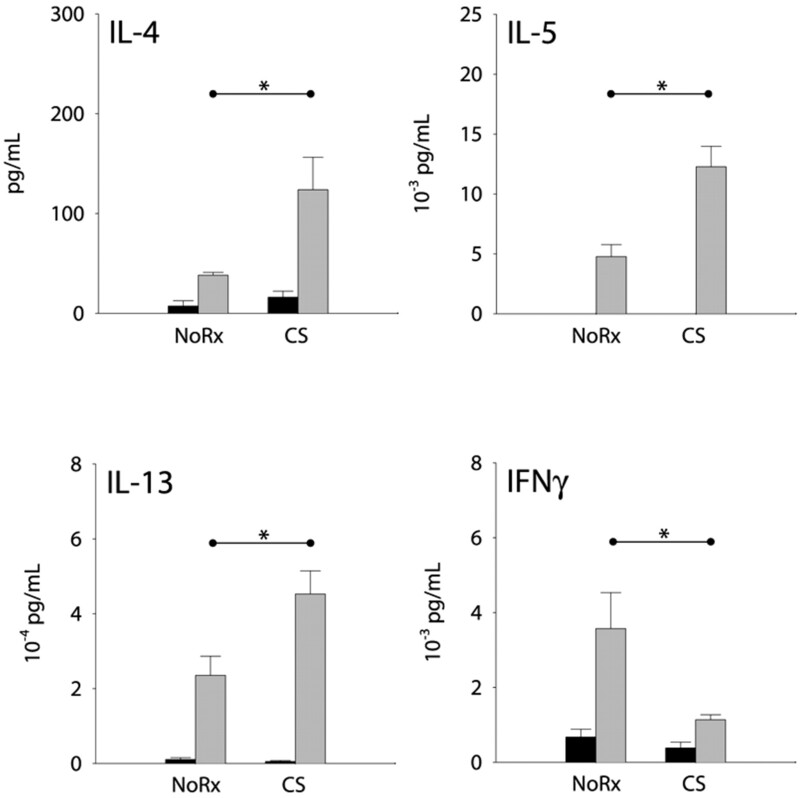 Although the therapeutic effect of CS in mice with established allergic disease extended to peripheral blood eosinophilia (Table II⇑), likely reflecting impaired recruitment and activation of IL-5-producing T cells in the lung, the content of OVA-specific IgE in serum was identical in treated and control mice (Fig. 3⇑B), intimating that the systemic immune response to OVA was unaffected by steroid treatment. Given the well-documented efficacy of steroids in the clinical management of inflammation associated with asthma, the anti-inflammatory effect of CS delivery to mice undergoing Ag challenge served to validate the clinical relevance of steroid intervention in our model of allergic airway inflammation. We were surprised, however, by an apparent discordance between the local and systemic effects of CS when administered during mucosal allergic sensitization to OVA. In contrast to unequivocal therapeutic effects in the lung, CS treatment elicited a 2-fold increase in the titer of OVA-specific IgE in serum (Table I⇑). Moreover, splenocytes harvested from mice sensitized to OVA in the context of CS delivery liberated substantially higher levels of Th2 cytokines, but far less IFN-γ, when stimulated with OVA in vitro (Fig. 4⇑), a finding that cannot be explained by the disproportionate retention of OVA-specific, Th2-polarized clones in steroid-treated mice (Table III⇑). Paradoxically, then, CS treatment, while at once affording outstanding therapeutic efficacy in the target organ, appears to have conditioned the hyperpolarization of the systemic Th2 immune response to OVA. We have considered and dismissed the possibility that this potentiation of OVA-specific Th2 immunity is an epiphenomenon of extended adenovirus-mediated GM-CSF expression, and therefore enhanced adjuvant activity, due to the suppression of antiviral immunity. We detect no difference in the level of GM-CSF protein in BAL of CS-treated compared with control mice at day 9 (data not shown), when previous kinetics studies in our model have shown that transgene expression has waned; moreover, the low dose of adenovirus we administered (3 × 107 PFU) results in negligible inflammation per se and therefore should not be especially susceptible to immunomodulation by CS (10). This interpretation is entirely consistent with the results of Kolb et al. (24), who have demonstrated that the kinetics and magnitude of IL-6 expression following a single, high-dose intranasal administration of Ad/IL-6 are not affected by concurrent delivery of CS to the airway. These results lend compelling insight into the immunological effects of CS treatment and identify an immunomodulatory function that transcends straightforward regulation of inflammation. Indeed, that Th2-affiliated, OVA-specific T cell responses in vitro are enhanced, while Th1 phenomena are depressed, when sensitization occurs in the context of CS intervention suggests a reprogramming of the immune response that one would expect to persist in the memory T cell pool. To test this hypothesis and to translate our findings at day 9 to a more clinically relevant experimental paradigm, we sensitized mice to OVA in the presence or absence of concurrent CS treatment and then, following the resolution of acute inflammation and in the absence of further pharmacological intervention, we rechallenged the mice with aerosolized OVA. The first salient finding emerging from this study is that treatment with CS during sensitization did not attenuate the long-term inflammatory response to allergen challenge in the lung: i.e., allergic airway disease has been neither cured nor exacerbated (Fig. 6⇑, A, C, and D). We have also demonstrated the physiological implications of this unaltered inflammatory response; whereas CS delivery during long-term OVA rechallenge significantly improved airway hyperresponsiveness in mice with established allergic disease, a history of CS intervention during primary OVA exposure did not ameliorate the physiological response when mice were rechallenged in the absence of further CS treatment (Fig. 7⇑). These results confirm that steroids do not prevent allergic sensitization and underscore the clinical importance of administering efficient doses of CS during asthma symptoms and exacerbations. Interestingly, this clear and (given clinical experience) somewhat predictable dissociation between the acute and long-term effects of CS on inflammation in the target organ was not reproduced systemically. The capacity of both splenocytes and lymph node mononuclear cells to elaborate Th2 cytokines in vitro remained substantially greater in rechallenged mice originally sensitized to OVA in the context of CS treatment (Fig. 5⇑ and Table IV⇑). Likewise, titers of OVA-specific IgE in serum, which had been twice as high as controls at day 9, were now 3-fold higher in rechallenged mice whose initial exposure to OVA was conditioned by CS (Fig. 6⇑B); peripheral blood eosinophilia was also elevated in these mice (Table V⇑). Thus, we observed an uncoupling of the long-term local and systemic effects of acute CS intervention: although treatment with CS during sensitization, despite unequivocal efficacy acutely, did not affect the inflammatory or physiological response in the airway upon OVA rechallenge, the potentiated systemic allergic response associated with CS delivery persisted and was even further polarized upon subsequent Ag exposure. This discordance may reflect the nature of our rechallenge protocol, which involves only three consecutive OVA exposures; perhaps a protracted protocol or one involving a tertiary challenge (i.e., OVA exposure following the resolution of inflammation during the initial recall) would have detected subtle changes in airway inflammation, although detailed kinetic studies are beyond the scope of this article. These results are particularly intriguing in the light of experimental evidence and published clinical precedent. Several groups have concluded that CS strongly potentiate IL-4-induced IgE synthesis by PBMC in vitro (25, 26, 27, 28), such that supplementation of culture medium with CS actually supplants the need for concomitant T cell help in IgE isotype switching (29). Using B cells from allergic patients, Bohle et al. (30) have shown that this CS-mediated IgE production is polyclonal and cannot be attributed to the selective enhancement of allergen-specific IgE. Clinically, a number of studies, some dating back several decades, have noted that therapeutically efficacious CS intervention is not associated with the reversal of seasonal, allergen-provoked increases in serum IgE (31, 32). Others have even reported an association between treatment with CS and a subsequent, if transient, elevation in serum IgE titer in asthma/allergy patients (33, 34) but not healthy volunteers (35). Although these studies do not impute an association between CS-induced changes in IgE and an exacerbation of the particular atopic condition responsible for a patient’s allergic manifestations, it is significant that the salient finding in these clinical reports, namely, that IgE is elevated in allergy patients following steroid treatment, mirrors the experimental findings we have documented systematically in mice. Of considerable interest is the immunological mechanism that might account for steroid-mediated potentiation of systemic Th2-polarized immunity. That we observed an irreversible hyperpolarization of T cell responses and sustained elevation of OVA-specific IgE intimates CS-mediated modulation of the APC compartment, details of which have been examined in a number of primarily in vitro studies. Although local steroid treatment predictably impairs the recruitment of APC to, for instance, the nasal mucosa in patients with allergic rhinitis (36, 37), there is less consensus on the implications of CS for APC function. Depending on the developmental status of APC and the culture conditions in which they are propagated, CS can retard differentiation of dendritic cells from monocytic (38, 39) and CD34+ precursors (40), and can also impair the terminal maturation and costimulatory capacity of monocytes in the presence of IFN-γ (41) and of a dendritic cell line in the presence of T cells or LPS (42). In contrast, Vanderheyde et al. (43) have shown that CD40 ligand-dependent maturation of in vitro-derived dendritic cells is unaffected by concurrent CS treatment and that GM-CSF-dependent up-regulation of MHCII on airway dendritic cells (44) or alveolar macrophages (45) is not attenuated in the presence of therapeutic doses of CS. In general, then, CS may be understood to arrest APC differentiation and function at stages upstream of Ag presentation, effects that are therefore obviated when APC are matured in the presence of potent activatory signals (18, 44, 46). Our own in vivo data generally concur with these in vitro observations. Flow cytometric analysis of dispersed lung cells from CS-treated mice revealed no diminution of the proportional expansion of both dendritic cells and macrophages during allergic sensitization (Fig. 8⇑A). Likewise, expression of the costimulatory molecules B7.1 and B7.2 by these APC were comparable to levels detected on cells from untreated controls (Fig. 8⇑B). The differentiation of a phenotypically mature APC compartment in the context of CS intervention likely reflects the continued presence of exogenous GM-CSF, the expression of whose receptor is enhanced by CS (47); CS, therefore, may establish a highly permissive environment for sensitization in our model (48, 49, 50). This interpretation explains why transient CS delivery to mice during sensitization neither impaired allergic sensitization nor mitigated the memory response in the absence of further CS treatment; it does not, however, decisively account for the potentiation of systemic features of Th2 immunity in the presence of CS. To this end, a number of investigators have argued that the ability of glucocorticoids to extinguish IL-12 secretion by APC (20, 21, 23) accounts for impaired Th1, and therefore enhanced Th2, cytokine secretion by T cells activated in vitro by CS-treated APC (16, 17, 18, 19, 22). However, we observed no appreciable difference in the fraction of IL-12-producing APC in the lungs of mice treated with CS during sensitization compared with untreated controls (Table VI⇑), suggesting that CS-mediated inhibition of APC-derived IL-12 may not account for the selective potentiation of Th2 immunity in vivo. Perhaps the observed hyperpolarization of Th2 cells and concomitant enhancement of IgE production in CS-treated mice reflects direct interaction of CS with glucocorticoid receptors in T cells (51, 52), which may directly suppress Th1 polarization (53). Our study is, to our knowledge, the first to demonstrate experimentally in vivo that CS, while affording an outstanding therapeutic index for local allergic airway inflammatory responses during treatment, do not ameliorate the underlying immune pathology responsible for allergic disease and actually amplify significant features of the allergic response when administered to mice during sensitization. Although it is difficult to infer a direct comparison of local vs systemic bioavailability of budesonide in humans and mice or to ascertain what constitutes a high vs a low dose of CS in mice, the in vivo biological effects of CS documented in this study are unequivocal and are consistent with published findings in humans. Of course, extrapolation of our data in mice to human asthma must be tempered by an awareness of the limitations of the model; the mucosal model is just one of many experimental systems that simulate human asthma in mice and, like most of these other models, it does not adequately mimic the chronicity or airway remodeling characteristic of human disease. These caveats notwithstanding, the clinical implications of this research are manyfold, but may have particular resonance in debates about when CS treatment should begin as an immune-inflammatory condition evolves. For instance, evidence that early and sustained intervention with steroids may forestall some of the irreversible airway dysfunction in asthma patients (54, 55, 56) would seem to recommend early initiation of steroid treatment (1). In contrast, our own data would caution against wholesale endorsement of such a therapeutic strategy, as CS treatment, particularly during sensitization, might accentuate features of the underlying immune pathology. It is certainly germane to distinguish our model, in which treatment occurs during sensitization, from clinical praxis, in which steroid treatment begins in already sensitized patients presenting asthmatic symptoms. However, it is by no means clear that allergic sensitization is a remote, immunologically hermetic, temporally discrete event impervious to subsequent alteration. If sensitization is an ongoing process, interventions that have the potential to modify sensitization should be evaluated even in patients with established disease. Steroids should, and undoubtedly will, continue to be the treatment of choice for chronic inflammatory processes such as asthma; the kinetics of optimal pharmaceutical intervention, however, remain an open question. We hope that this study will encourage clinical practitioners to titrate CS treatment to minimal effective doses, to avoid overtreatment of asthma with steroids, and to include additional immunological metrics, such as serum IgE measurements or PBMC responses in vitro, as they investigate the advantages of early or prolonged steroid treatment in the management of allergic airway inflammatory responses. The secretarial assistance of Mary Kiriakopoulos and the technical support of Joanna deJong are gratefully acknowledged. ↵1 This work was funded in part by the Canadian Institutes of Health Research and AstraZeneca, Inc. (Sweden). R.E.W. and D.A. hold Canadian Institutes of Health Research Doctoral Research Awards; J.R.J. is the recipient of an Ontario Graduate Scholarship. ↵3 Abbreviations used in this paper: CS, corticosteroid; Ad, adenovirus; BAL, bronchoalveolar lavage; RSR, respiratory system resistance; MCh, methacholine; MIP-1α, macrophage-inflammatory protein 1α; NoRx, no treatment; MHCII, MHC class II. Barnes, P. J., S. Pedersen, W. W. Busse. 1998. Efficacy and safety of inhaled corticosteroids: new developments. Am. J. Respir. Crit. Care Med. 157:S1. Bentley, A. M., Q. Hamid, D. S. Robinson, E. Schotman, Q. Meng, B. Assoufi, A. B. Kay, S. R. Durham. 1996. Prednisolone treatment in asthma: reduction in the numbers of eosinophils, T cells, tryptase-only positive mast cells, and modulation of IL-4, IL-5, and interferon-γ cytokine gene expression within the bronchial mucosa. Am. J. Respir. Crit. Care Med. 153:551. Gauvreau, G. M., J. Doctor, R. M. Watson, M. Jordana, P. M. O’Byrne. 1996. Effects of inhaled budesonide on allergen-induced airway responses and airway inflammation. Am. J. Respir. Crit. Care Med. 154:1267. Jeffery, P. K., R. W. Godfrey, E. Adelroth, F. Nelson, A. Rogers, S. A. Johansson. 1992. Effects of treatment on airway inflammation and thickening of basement membrane reticular collagen in asthma: a quantitative light and electron microscopic study. Am. Rev. Respir. Dis. 145:890. Shen, H., P. M. O’Byrne, R. Ellis, J. Wattie, C. Tang, M. D. Inman. 2002. The effects of intranasal budesonide on allergen-induced production of interleukin-5 and eotaxin, airways, blood, and bone marrow eosinophilia, and eosinophil progenitor expansion in sensitized mice. Am. J. Respir. Crit. Care Med. 166:146. Barnes, P. J.. 2000. New directions in allergic diseases: mechanism-based anti-inflammatory therapies. J. Allergy Clin. Immunol. 106:5. Brattsand, R.. 1997. What factors determine anti-inflammatory activity and selectivity of inhaled steroids?. Eur. Respir. Rev. 7:356. Brattsand, R.. 1999. The ideal steroid. Pulm. Pharmacol. Ther. 12:119. Wieslander, E., E. L. Delander, L. Jarkelid, E. Hjertberg, A. Tunek, R. Brattsand. 1998. Pharmacologic importance of the reversible fatty acid conjugation of budesonide studied in a rat cell line in vitro. Am. J. Respir. Cell Mol. Biol. 19:477. Stämpfli, M. R., R. E. Wiley, G. S. Neigh, B. U. Gajewska, X. F. Lei, D. P. Snider, Z. Xing, M. Jordana. 1998. GM-CSF transgene expression in the airway allows aerosolized ovalbumin to induce allergic sensitization in mice. J. Clin. Invest. 102:1704. Ohkawara, Y., X. F. Lei, M. R. Stämpfli, J. S. Marshall, Z. Xing, M. Jordana. 1997. Cytokine and eosinophil responses in the lung, peripheral blood, and bone marrow compartments in a murine model of allergen-induced airways inflammation. Am. J. Respir. Cell Mol. Biol. 16:510. Swirski, F. K., B. U. Gajewska, D. Alvarez, S. A. Ritz, M. J. Cundall, E. C. Cates, A. J. Coyle, J. C. Gutierrez-Ramos, M. D. Inman, M. Jordana, M. R. Stämpfli. 2002. Inhalation of a harmless antigen (ovalbumin) elicits immune activation but divergent immunoglobulin and cytokine activities in mice. Clin. Exp. Allergy 32:411. Coyle, A. J., C. Lloyd, J. Tian, T. Nguyen, C. Erikkson, L. Wang, P. Ottoson, P. Persson, T. Delaney, S. Lehar, et al 1999. Crucial role of the interleukin 1 receptor family member T1/ST2 in T helper cell type 2-mediated lung mucosal immune responses. J. Exp. Med. 190:895. Townsend, M. J., P. G. Fallon, D. J. Matthews, H. E. Jolin, A. N. McKenzie. 2000. T1/ST2-deficient mice demonstrate the importance of T1/ST2 in developing primary T helper cell type 2 responses. J. Exp. Med. 191:1069. Gajewska, B. U., F. K. Swirski, D. Alvarez, S. A. Ritz, S. Goncharova, M. Cundall, D. P. Snider, A. J. Coyle, J. C. Gutierrez-Ramos, M. R. Stämpfli, M. Jordana. 2001. Temporal-spatial analysis of the immune response in a murine model of ovalbumin-induced airways inflammation. Am. J. Respir. Cell Mol. Biol. 25:326. Bellinghausen, I., U. Brand, K. Steinbrink, A. H. Enk, J. Knop, J. Saloga. 2001. Inhibition of human allergic T-cell responses by IL-10-treated dendritic cells: differences from hydrocortisone-treated dendritic cells. J. Allergy Clin. Immunol. 108:242. Blotta, M. H., R. H. DeKruyff, D. T. Umetsu. 1997. Corticosteroids inhibit IL-12 production in human monocytes and enhance their capacity to induce IL-4 synthesis in CD4+ lymphocytes. J. Immunol. 158:5589.
de Jong, E. C., P. L. Vieira, P. Kalinski, M. L. Kapsenberg. 1999. Corticosteroids inhibit the production of inflammatory mediators in immature monocyte-derived DC and induce the development of tolerogenic DC3. J. Leukocyte Biol. 66:201. DeKruyff, R. H., Y. Fang, D. T. Umetsu. 1998. Corticosteroids enhance the capacity of macrophages to induce Th2 cytokine synthesis in CD4+ lymphocytes by inhibiting IL-12 production. J. Immunol. 160:2231. Canning, M. O., K. Grotenhuis, H. J. de Wit, H. A. Drexhage. 2000. Opposing effects of dehydroepiandrosterone and dexamethasone on the generation of monocyte-derived dendritic cells. Eur. J. Endocrinol. 143:687. Rea, D., C. van Kooten, K. E. van Meijgaarden, T. H. Ottenhoff, C. J. Melief, R. Offringa. 2000. Glucocorticoids transform CD40-triggering of dendritic cells into an alternative activation pathway resulting in antigen-presenting cells that secrete IL-10. Blood 95:3162. Vieira, P. L., P. Kalinski, E. A. Wierenga, M. L. Kapsenberg, E. C. de Jong. 1998. Glucocorticoids inhibit bioactive IL-12p70 production by in vitro-generated human dendritic cells without affecting their T cell stimulatory potential. J. Immunol. 161:5245. Visser, J., A. van Boxel-Dezaire, D. Methorst, T. Brunt, E. R. de Kloet, L. Nagelkerken. 1998. Differential regulation of interleukin-10 (IL-10) and IL-12 by glucocorticoids in vitro. Blood 91:4255. Kolb, M., M. Inman, P. J. Margetts, T. Galt, J. Gauldie. 2001. Budesonide enhances repeated gene transfer and expression in the lung with adenoviral vectors. Am. J. Respir. Crit. Care Med. 164:866. Jabara, H. H., D. J. Ahern, D. Vercelli, R. S. Geha. 1991. Hydrocortisone and IL-4 induce IgE isotype switching in human B cells. J. Immunol. 147:1557. Jabara, H. H., R. Loh, N. Ramesh, D. Vercelli, R. S. Geha. 1993. Sequential switching from μ to ε via γ 4 in human B cells stimulated with IL-4 and hydrocortisone. J. Immunol. 151:4528. Nusslein, H. G., G. Weber, J. R. Kalden. 1994. Synthetic glucocorticoids potentiate IgE synthesis. Influence of steroid and nonsteroid hormones on human in vitro IgE secretion. Allergy 49:365. Wu, C. Y., M. Sarfati, C. Heusser, S. Fournier, M. Rubio-Trujillo, R. Peleman, G. Delespesse. 1991. Glucocorticoids increase the synthesis of immunoglobulin E by interleukin 4-stimulated human lymphocytes. J. Clin. Invest. 87:870. Nusslein, H. G., T. Trag, M. Winter, A. Dietz, J. R. Kalden. 1992. The role of T cells and the effect of hydrocortisone on interleukin-4-induced IgE synthesis by non-T cells. Clin. Exp. Immunol. 90:286. Bohle, B., M. Willheim, K. Baier, B. Stadler, S. Spitzauer, O. Scheiner, D. Kraft, C. Ebner. 1995. Hydrocortisone enhances total IgE levels—but not the synthesis of allergen-specific IgE—in a monocyte-dependent manner. Clin. Exp. Immunol. 101:474. Gunnar, S., O. Johansson, L. Juhlin. 1970. Immunoglobulin E in “healed” atopic dermatitis and after treatment with corticosteroids and azathioprine. Br. J. Dermatol. 82:10. Henderson, L. L., J. B. Larson, G. J. Gleich. 1973. Effect of corticosteroids on seasonal increases in IgE antibody. J. Allergy Clin. Immunol. 52:352. Settipane, G. A., R. K. Pudupakkam, J. H. McGowan. 1978. Corticosteroid effect on immunoglobulins. J. Allergy Clin. Immunol. 62:162. Zieg, G., G. Lack, R. J. Harbeck, E. W. Gelfand, D. Y. Leung. 1994. In vivo effects of glucocorticoids on IgE production. J. Allergy Clin. Immunol. 94:222. Klebl, F. H., G. Weber, J. R. Kalden, H. G. Nusslein. 1994. In vitro and in vivo effect of glucocorticoids on IgE and IgG subclass secretion. Clin. Exp. Allergy 24:1022. Holm, A. F., T. Godthelp, W. J. Fokkens, E. A. Severijnen, P. G. Mulder, T. M. Vroom, E. Rijntjes. 1999. Long-term effects of corticosteroid nasal spray on nasal inflammatory cells in patients with perennial allergic rhinitis. Clin. Exp. Allergy 29:1356. Till, S. J., M. R. Jacobson, F. O’Brien, S. R. Durham, A. KleinJan, W. J. Fokkens, S. Juliusson, O. Lowhagen. 2001. Recruitment of CD1a+ Langerhans cells to the nasal mucosa in seasonal allergic rhinitis and effects of topical corticosteroid therapy. Allergy 56:126. Piemonti, L., P. Monti, P. Allavena, M. Sironi, L. Soldini, B. E. Leone, C. Socci, C. C., V. Di Carlo. 1999. Glucocorticoids affect human dendritic cell differentiation and maturation. J. Immunol. 162:6473.
van den Heuvel, M. M., N. M. van Beek, E. Broug-Holub, P. E. Postmus, E. C. Hoefsmit, R. H. Beelen, G. Kraal. 1999. Glucocorticoids modulate the development of dendritic cells from blood precursors. Clin. Exp. Immunol. 115:577. Woltman, A. M., C. Massacrier, J. W. de Fijter, C. Caux, C. van Kooten. 2002. Corticosteroids prevent generation of CD34+-derived dermal dendritic cells but do not inhibit Langerhans cell development. J. Immunol. 168:6181. Girndt, M., U. Sester, H. Kaul, F. Hunger, H. Kohler. 1998. Glucocorticoids inhibit activation-dependent expression of costimulatory molecule B7-1 in human monocytes. Transplantation 66:370. Kitajima, T., K. Ariizumi, P. R. Bergstresser, A. Takashima. 1996. A novel mechanism of glucocorticoid-induced immune suppression: the inhibition of T cell-mediated terminal maturation of a murine dendritic cell line. J. Clin. Invest. 98:142. Vanderheyde, N., V. Verhasselt, M. Goldman, F. Willems. 1999. Inhibition of human dendritic cell functions by methylprednisolone. Transplantation 67:1342. Holt, P. G., J. A. Thomas. 1997. Steroids inhibit uptake and/or processing but not presentation of antigen by airway dendritic cells. Immunology 91:145. Caulfield, J. J., M. H. Fernandez, A. R. Sousa, S. J. Lane, T. H. Lee, C. M. Hawrylowicz. 1999. Regulation of major histocompatibility complex class II antigens on human alveolar macrophages by granulocyte-macrophage colony-stimulating factor in the presence of glucocorticoids. Immunology 98:104. Matyszak, M. K., S. Citterio, M. Rescigno, P. Ricciardi-Castagnoli. 2000. Differential effects of corticosteroids during different stages of dendritic cell maturation. Eur. J. Immunol. 30:1233. Hawrylowicz, C. M., L. Guida, E. Paleolog. 1994. Dexamethasone up-regulates granulocyte-macrophage colony-stimulating factor receptor expression on human monocytes. Immunology 83:274. Almawi, W. Y., H. N. Beyhum, A. A. Rahme, M. J. Rieder. 1996. Regulation of cytokine and cytokine receptor expression by glucocorticoids. J. Leukocyte Biol. 60:563. Munck, A., A. Naray-Fejes-Toth. 1992. The ups and downs of glucocorticoid physiology. Permissive and suppressive effects revisited. Mol. Cell. Endocrinol. 90:C1. Sapolsky, R. M., L. M. Romero, A. U. Munck. 2000. How do glucocorticoids influence stress responses? Integrating permissive, suppressive, stimulatory, and preparative actions. Endocr. Rev. 21:55. Duval, D., F. Homo, C. Fournier, J. P. Dausse. 1979. Glucocorticoid receptors in mouse spleen cell subpopulations. Cell. Immunol. 46:1. Ramirez, F., D. J. Fowell, M. Puklavec, S. Simmonds, D. Mason. 1996. Glucocorticoids promote a Th2 cytokine response by CD4+ T cells in vitro. J. Immunol. 156:2406. Miyaura, H., M. Iwata. 2002. Direct and indirect inhibition of Th1 development by progesterone and glucocorticoids. J. Immunol. 168:1087. Agertoft, L., S. Pedersen. 1994. Effects of long-term treatment with an inhaled corticosteroid on growth and pulmonary function in asthmatic children. Respir. Med. 88:373. Haahtela, T., M. Jarvinen, T. Kava, K. Kiviranta, S. Koskinen, K. Lehtonen, K. Nikander, T. Persson, O. Selroos, A. B. Sovijarvi, et al 1994. Effects of reducing or discontinuing inhaled budesonide in patients with mild asthma. N. Engl. J. Med. 331:700. Selroos, O., A. Pietinalho, A. B. Lofroos, H. Riska. 1995. Effect of early vs late intervention with inhaled corticosteroids in asthma. Chest 108:1228.